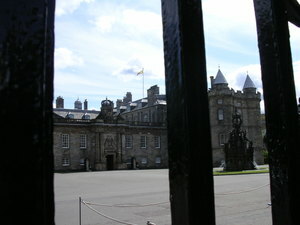 This second photo is looking down on Holyroodhouse Palace. Yeah, I was a little obsessed with the Palace. As you can see, the flag is up meaning that the Royals are still in residence and messing up my chance to tour the spot where Mary, Queen of Scot's secretary David Rizzio was murdered in 1566 and where the current Queen Elizabeh takes her tea. Dang it! 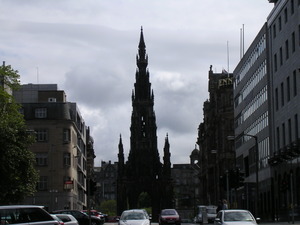 This is a photo of the Scott monument located in the Prince's Street Gardens. 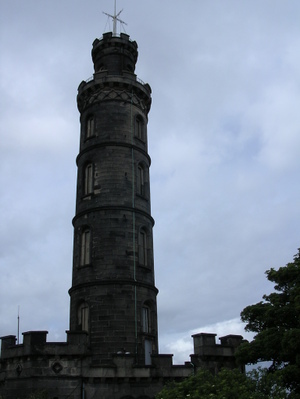 It was built to commemorate Sir Walter Scott, the writer of Ivanhoe and Rob Roy (among other books) who died in 1832. 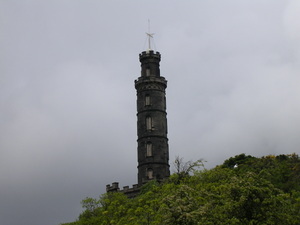 The monument was completed in 1846. It's another location that you can climb up for great views although again, we were on the move so we just snapped some photos at the base. We had lunch on the "Forth" floor of Harvey Nichols. ("Harvey Nicks" if you're in the know - or if you watch too much "Absolutely Fabulous" like myself) It's called the "Forth" floor because you can see the River Forth from the windows of the cafe. It was pretty good food and a nice view. They also had a jazz duet which was relaxing after so much walking. We hit the National Gallery of Scotland after lunch - they have a great collection that includes Reubens, Titian, Monet and Van Gogh as well as the largest collection of Scottish artists. 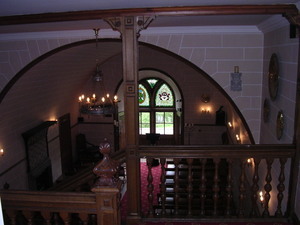 It's a beautiful building as well and - Free! After a quick nap at the hotel and a dinner of AWESOME Indian food, we took the 10 pm ghost tour with Mercat Tours. It was lots of fun. 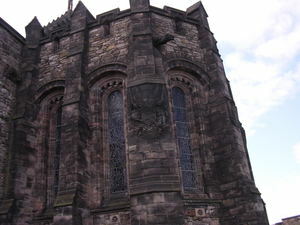 We learned quite a bit about Edinburgh history through our tour of the graveyard (spooky!) which culminated inside a tomb and almost made me pee my pants with fright. I guess that's what you want out of ghost tour though, right? 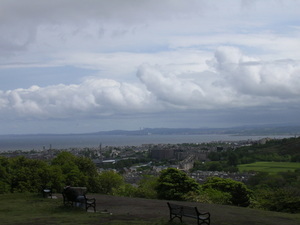 That pretty much wrapped up our visit to Edinburgh - but we will be going back to Scotland and back to Edinburgh soon. It's a great city filled with beautiful sights, great people and good food! 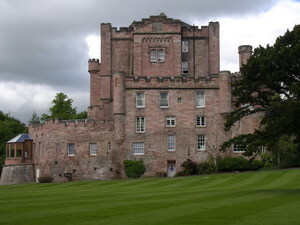 We spent two and a half days of our vacation in Scotland at Dalhousie Castle & Spa. 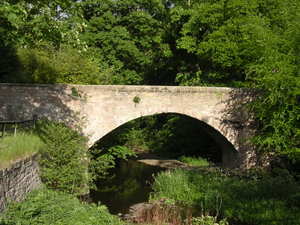 It's in a gorgeous location in the Midlothian area outside of Edinburgh. 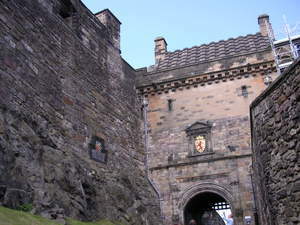 The walls of the foundation and the vaults of the castle are from the original building which was constructed in the 13th century. 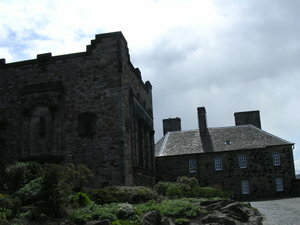 The main parts of the current castle were built in 1450. 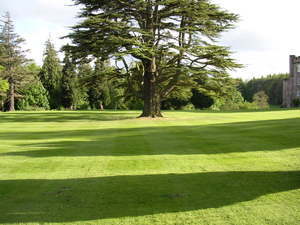 The land surrounding the castle and the castle itself have a long history dating from 1140 - there's not really enough space here to type it up but feel free to check it out Dalhousie Castle History. 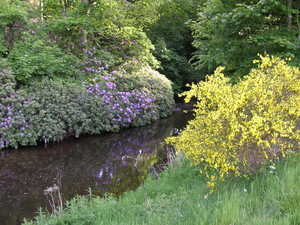 The area surrounding the castle is just lovely. 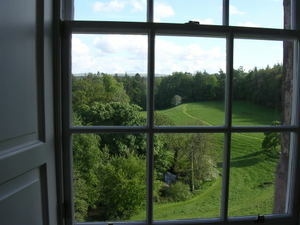 This is a photo of the view from our room. We were looking down on the little river and park area. We really took advantage of our time at Dalhousie to just relax and unwind. After our walk we hung outside for a bit just reading while soaking up the sun, the breeze and the scenery. For dinner we tried out the hotel's Orangery restaurant. It was pretty good - not oustanding, but better than most of the meals we've had in Spain. 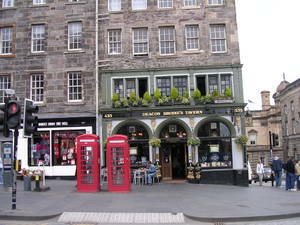 The hotel has a fine dining restaurant called the Dungeon Restaurant. It's in the barrel vaulted dungeons of the castle and is a pretty dramatic location. However, we had read some lukewarm reviews of the restaurant (which is also pretty expensive) and decided to skip it. We had our romantic "anniversary" dinner at The Secret Garden in Edinburgh the night before and could not have asked for a better meal. 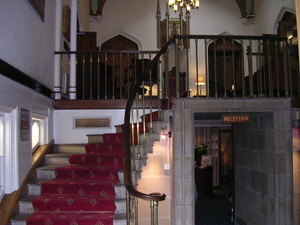 Something to keep in mind if you ever decide to head out to Dalhousie castle is that if you don't drive your own car, you're pretty much stuck at the castle for meals and activities. (Unless you want to pay for an expensive cab ride back into town). For us, it was fine as we had planned to use the time to relax - and we did! 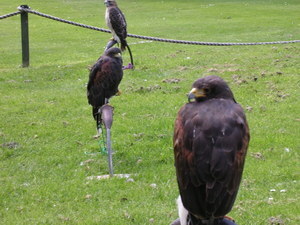 Our second day at Dalhousie Castle we went falconing! Yep, falconing. 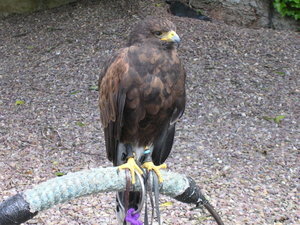 The castle has a falconry center with a pretty impressive stock of birds. 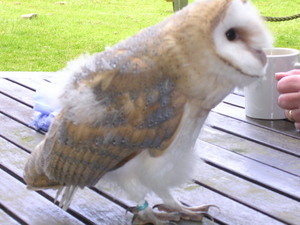 We flew falcons, kestrels and a variety of owls (they're also birds of prey). 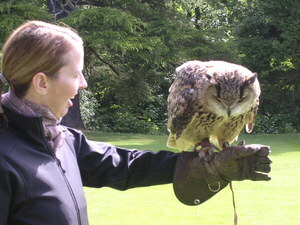 This is the castle's falconer, Julie. 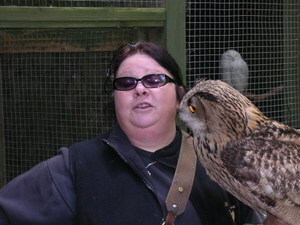 The woman is a walking encyclopedia on birds of prey. 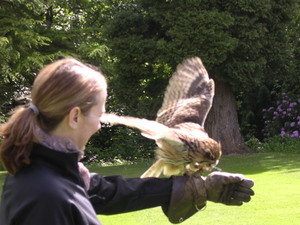 We were really impressed with her knowledge, her bird handling skills and her sense of humour. The woman is a kick in the pants! This little cutie was just a baby and not old enough yet to fly around. She just hopped on the table where we had our coffee break and climbed all over everyone. I wish we could have captured photos of the little kestrel that Julie took out to show us their hunting techniques. This little bird flew so fast and swooped down from a really spectacular height to attack her "prey" (it was a little ball on a string - we didn't see the birds attack any live animals. Although, Julie said that once in a while the birds DO go after a rabbit hopping around the property in the middle of one of her demonstrations. She said a few people were traumatized by this at Easter.) I really enjoyed being so close to these birds and seeing what they're capable of. It was a great experience. 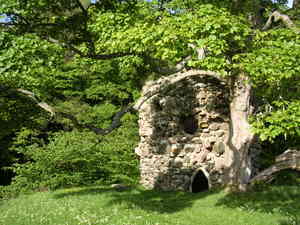 This is a picture of the little chapel inside the castle. 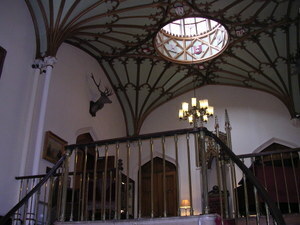 There were three weddings in the 2 plus days that we stayed at the castle. 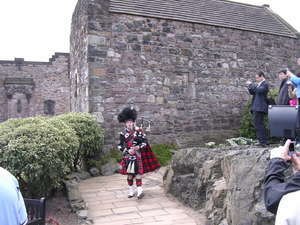 They were all really pretty and because of the weddings we enjoyed bagpipe music every day were there. As an interesting side note, Julie told us that you can pay an extra fee and have one of the falcons deliver your wedding rings to the best man during the ceremony. That's a pretty original wedding memory! 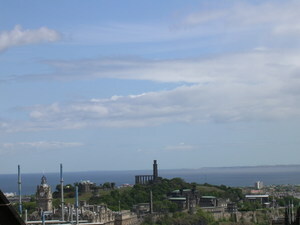 I'll put up a post about our last day in Edinburgh and our final round of sight seeing later. Hope you're enjoying the pics! My hubby and I didn't really have a traditional wedding and - with all the lead up to the move to Spain - we didn't take a honeymoon either. (After all, we were moving to Madrid, we figured the whole stint here would be one long honeymoon.) But this year on our first anniversary, we decided to take the honeymoon we never had and visit Scotland for a long weekend. It was a GREAT idea! 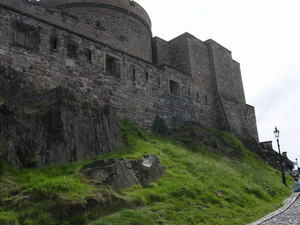 We decided to stay in Edinburgh area since we were just there for a long weekend. 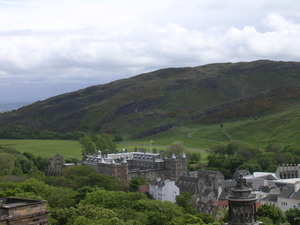 (We're going to try to get to Glasgow, Isle of Skye and Inverness on another trip). 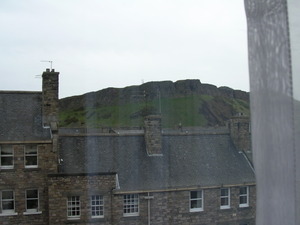 Our first day in Scotland we stayed in Edinburgh itself. 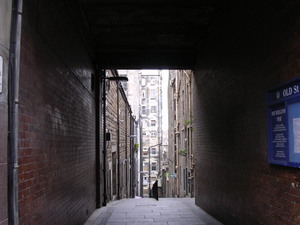 We arrived in the late afternoon, so there was just enough time to take a walk down the Royal Mile before getting ready for dinner at the Secret Garden - a decadent restaurant inside The Witchery which is an equally decadent hotel in Edinburgh. 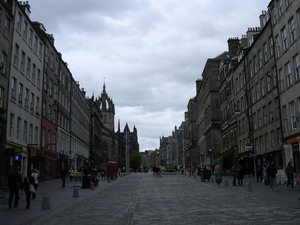 The Royal Mile is the stretch of High Street that starts at Edinburgh Castle and ends at Holyroodhouse Palace. 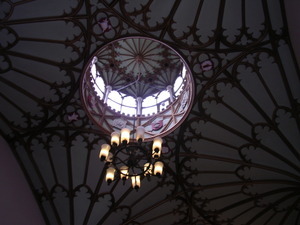 For an anglophile like me - it was heaven! 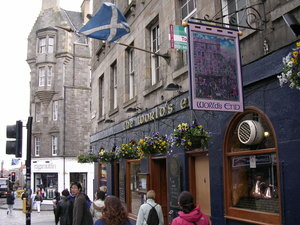 The pub "World's End" is great! We ate there our last day in Edinburgh and the food was delicious. 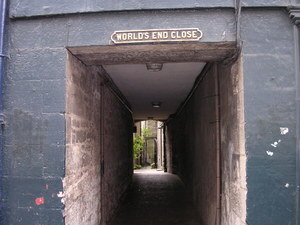 The two photos of what looks like little alleys are basically alleys but they are called "closes" - a "close" is a "closed alley" - they're very narrow and date from the medievel era in Edinburgh. They were the primary way people accessed their homes then and they allowed the maximum density of buildings while also providing quick access through shortcuts between places (you didn't have to follow the main streets). The buildings were built several stories up (10 or more in some buildings) and the method of waste disposal was to throw your garbage (and sewage) out the window and into the street. You can imagine that the filth and garbage that collected in these narrow passes was pretty horendous. 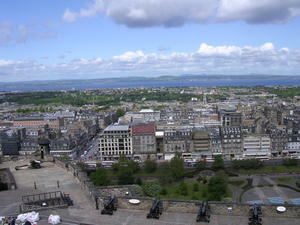 Edinburgh apparently had a lot of problems during that time with plague and disease due to their sewage "system". Look at that! 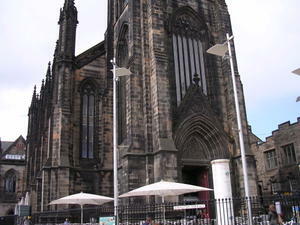 I have a guidebook for Scotland too! 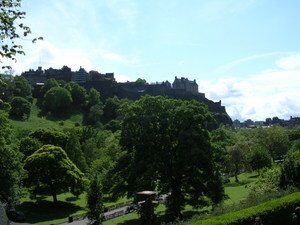 Of course now Edinburgh is easily one of the cleanest cities I've ever visited. 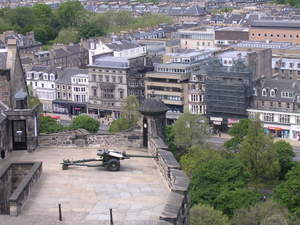 That's the Nelson Monument in the background of the second photo. After touring the Castle we went for lunch at a local pub. I had the greatest fish and chips of my life and my hubby had Yorkshire pudding with a locally made pork/fennel sausage that was delicious. He also convinced me to split an appetizer of haggis balls and - as it turned out - I was pleasantly surprised at how much I enjoyed Haggis. Boo! Hiss! As it turns out, the Queen was in residence the day before we arrived in Edinburgh and Prince Andrew was still there for some event. For some reason they don't let the unwashed masses tour the palace when the Royals are in residence. 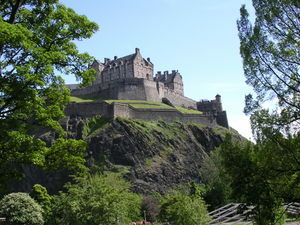 It was kind of a let down - but it gives me a good excuse to plan a trip back to Edinburgh. 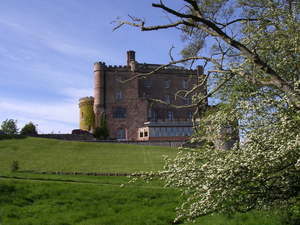 After a little window shopping we took a cab out to the countryside of Midlothian - about 10 or so miles from Edinburgh to our next destination - Dalhousie Castle - where we planned to stay for a couple of days. I'll post some photos of our stay at Dalhousie a little later!